White is Classic. White is timeless. White sets a decidedly soft tone. White is the perfect fit for the nursery. 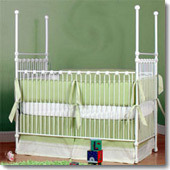 White baby cribs are clean and pure – they’re a perfect complement to precious little boys and girls.